Le Curvy Kitten: Introducing Liliana and Betty by new brand Tutti Rouge! Introducing Liliana and Betty by new brand Tutti Rouge! I know I'm a bit late on the uptake here, but since I've only just managed to get myself into a Bravissimo store, I hope you'll forgive me! Tutti's first release was the Liliana. At £26 (£14 for the shorts, £12 for the thong) it's in the lower price range of fuller bust bras, but has all the details and design you'd expect from an established brand. Liliana is a bright coral-pink padded bra with a mesh upper section to the cups. It's described as a balcony bra and has fully adjustable straps and is available in sizes 28-38D-J. 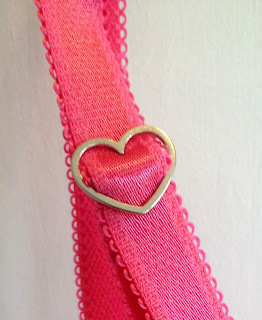 I love the little details that Tutti Rouge add to their bras, such as the little heart shaped adjusters and their brand name embossed into the back fastener. Both of these photos were taken from Tutti Rouge's facebook page. The second release from Tutti Rouge was the Betty, £32 (shorts £16) a pretty floral padded half cup with oodles of lace trimming. Betty is available in sizes 28-38 DD-HH. Again, the bra features the heart shaped adjusters and embossed fastener at the back, and again, as much as it pains me to say it, but unfortunately for me it didn't work. I tried the Betty in a 28H and it had a very flattening effect on me. The lack of fully adjustable straps also didn't do me any favours, resulting in no support or shape whatsoever and it also had an east/west effect on me. Again, in the interest of balance, here are two more reviews from The Style Rawr and The Lingerie Addict. Will you be trying Tutti Rouge? Or have you already tried them, and what did you think? The Tutti Rouge Liliana set is a pretty shade of pink and I agree that those heart-shaped adjusters are a nice touch. I love the very feminine look of both bras you've modeled and reviewed here. I took a look at the matching Liliana shorts on bravissimo.com , and though I like the very feminine appearance and are a lovely looking thong I only wear full cut full coverage briefs. The Tutti Rouge Liliana shorts have the appearance to me of giving a wedgie (which is why I generally don't wear thongs - though I can imagine certain special occasions when I might if I had a partner. I love the delicate lacy trim, pink bow, ivory floral print and satiny look of the Tutti Rouge Betty bra - there was no back view of the shorts (perhaps I should have commented when prompted on the site). The straps on both bras looked to me like they could be a bit wider for people who require a larger cup size, though I know very little about that subject. I noted that they had sizes up to 28 J. It would be wonderful if Tutti Rouge continued to improve on its pretty lingerie lines added high-waist retro styled knickers in those same colours and with that same ornamentation. Summarizing, I think you look very attractive in both of these pretty bras even though they weren't perfect for you.